In the early 1990s, post-Tito Yugoslavia began to unravel along ethnic lines: Slovenia, Croatia, The Former Yugoslav Republic of Macedonia, and Bosnia and Herzegovina were recognized as independent states in 1992. The remaining republics of Serbia and Montenegro declared a new "Federal Republic of Yugoslavia" (FRY) in April 1992 and, under President Slobodan Milosevic, Serbia led various military intervention efforts to unite ethnic Serbs in neighboring republics into a "Greater Serbia." All of these efforts were unsuccessful and led to Yugoslavia being ousted from the UN in 1992. In 1999, massive expulsions by FRY forces and Serb paramilitaries of ethnic Albanians living in Kosovo provoked an international response, including the NATO bombing of Serbia and the stationing of NATO, Russian, and other peacekeepers in Kosovo. Federal elections in 2000, brought about the ouster of Milosevic and installed Vojislav Kostunica as president. The arrest of Milosevic in 2001 allowed for his subsequent transfer to the International Criminal Tribunal for the Former Yugoslavia in The Hague to be tried for crimes against humanity. In 2001, the country was accepted into UN organizations under the name of Yugoslavia. Kosovo has been governed by the UN Interim Administration Mission in Kosovo, since June 1999. In February 2003, Serbia and Montenegro became a federation of two republics, but in 2006, both republics became independent. In 2008, Kosovo became an independent country. Belgrade, located at the confluence of the Danube and Sava Rivers, is the capital of the Republic of Serbia. The core of old Belgrade, known as Kalemegdan, is located along the right banks of both the Danube and the Sava Rivers (image center). To the west across the Sava, Novi Beograd (New Belgrade) was constructed following WWII. 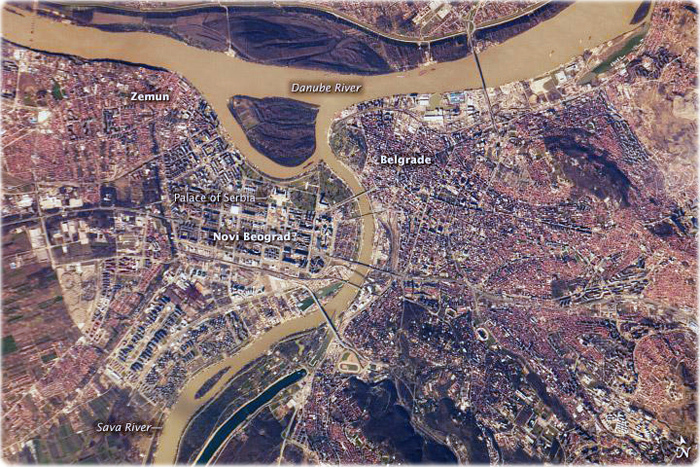 The difference in urban patterns between the older parts of Belgrade and Novi Beograd is striking in this astronaut photograph from the International Space Station. Novi Beograd has an open grid structure formed by large developments and buildings such as the Palace of Serbia, now used to house elements of the Serbian Government. By contrast, the older urban fabric of Belgrade is characterized by a denser street grid and numerous smaller structures. The location of Belgrade along trade and travel routes between the East and West contributed to both its historical success as a center of trade and its fate as a battleground. Today, the city is the financial center of Serbia, while Novi Beograd supports one of the largest business districts in southeastern Europe (NASA).